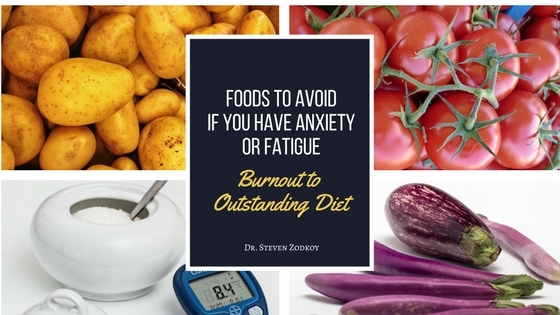 As Dr. Steven Zodkoy is working on his new book, “Burnout to Outstanding : A Diet plan for those with fatigue and anxiety”, there are some key guidelines to losing weight when you are Burnout and suffering with adrenal fatigue and anxiety. 3. Simple carbohydrates: sugar, white flour, etc. 7. Fruits – should be limited to only 1 and it should be for your mid morning snack. Avoid berries or soft fruit because they have to much sugar. Go with a fruit that has a low glycemic index , organic and fresh. My top picks are pears, apples, and grapes. I suggest your print out a list of high and low glycemic foods. Avoid the high glycemic foods becuase they intefer with the normal cortisol-glucose pattern…. concentrate on eating low glycemic foods because they promote normal cortisol-glucose pattern.